After the Mobile Service was deployed we want to run acceptance tests. I’ve created a sample C# project using SpecFlow. It doesn’t have to be Acceptance Tests, I just wanted to give an example of how you’ll integrate SpecFlow with TeamCity. The solution contains the “Specifications” project which are a set of SpecFlow scenarios. 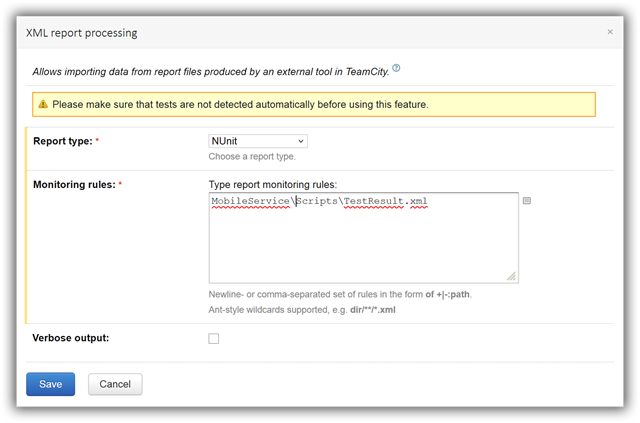 SpecFlow has the ability to generate reports – we’ll be generating one report and integrate it with TeamCity. We’ll create a new file – acceptance-tests.ps1 in the Scripts folder. In order to generate a report we need to run a command which executes the NUnit tests as described in the documentation https://github.com/techtalk/SpecFlow/wiki/Reporting. For this purpose we need NUnit console app. I’ve added nuget package manually. Otherwise, it will install the package as a solution package. First step is to execute the acceptance tests with the nunit-console runner. It will generate two files: TestResult.txt and TestResult.xml. These files will be used when invoking SpecFlow report generation. TestResult name is the default name so if you don’t change it then in the next step you don’t have to provide additional parameters. You just need to provide the SpecFlow project file. & $specFlow nunitexecutionreport "..\Source\Specifications\Specifications.csproj" /out:"..\TestResult.html"
This will generate TestResult.html report file in the root folder. For this reason we copy specflow.exe.config file to the packages folder. 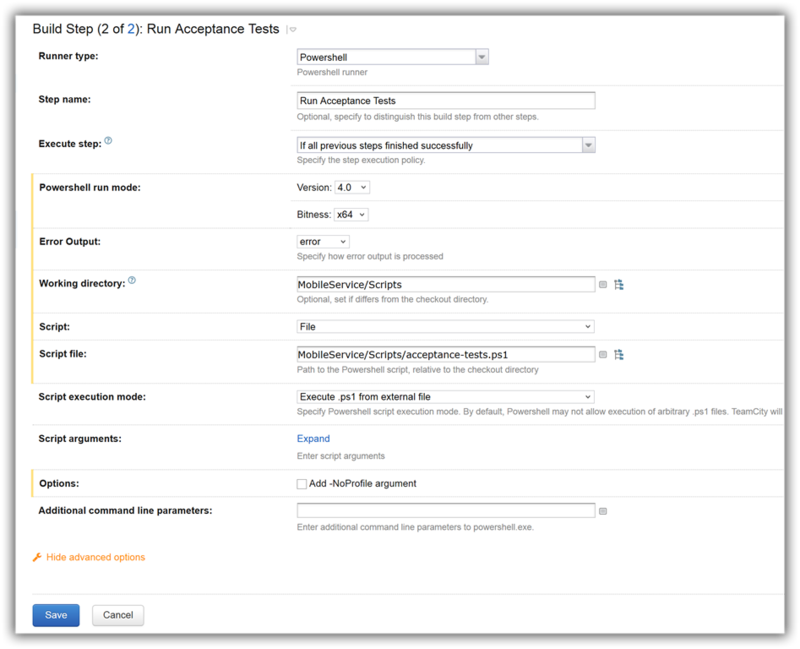 We can update our build so that after deployment it runs the SpecFlow Acceptance Tests and gives us the detailed report about the execution. In the TeamCity configuration page open the Build Steps page. Add a new build step. As you might guess this will be another PowerShell configuration. The configuration is similar to the one we did before. Working directory is MobileService/Scripts and Script file is MobileService/Scripts/acceptance-tests.ps1 with no parameters. Next we need to configure TeamCity to display our SpecFlow report. First we add Build Feature – XML Report processing. The purpose of this is that TeamCity will take our TestsResult.xml file will parse it and report the results as the build results. In this way we can add out Acceptance Tests to be part of the CI process and they will be displayed in Test Results tab as well. 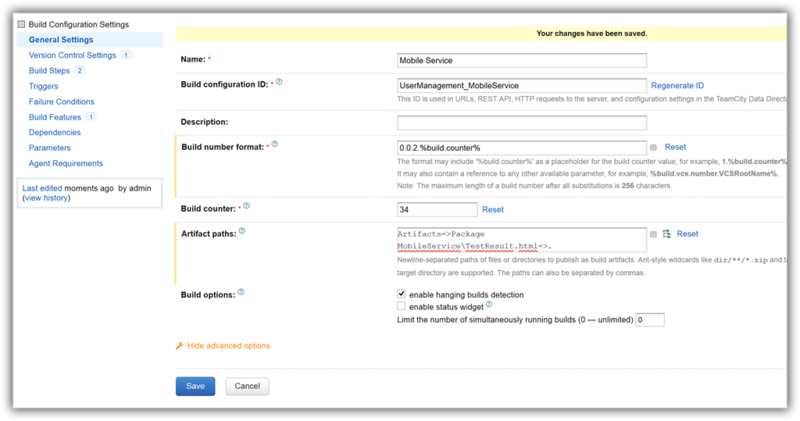 In the Build Configuration Settings page click on the Build Features and Add build feature. Select XML report processing from the drop down and select NUnit from the Report type. Add Scripts\TestResult.xml in the Monitoring rules. Next step we’ll configure TeamCity result page to display the SpecFlow result page TestResult.html in a new tab. Open the Administration page and click on the User Management project. Click on the Report Tabs link. Click on the Create new build report tab. 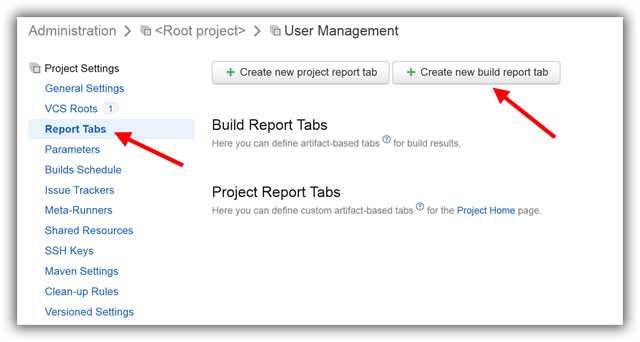 In the new dialog enter the Tab title – that will be the title of the tab which appears in the build result page and Start page which in our case will be TestResult.html. Now when we run the build we have a nice SpecFlow report. This finishes the full continuous integration and deployment of an Azure Mobile Service in TeamCitiy. But there one last step which is outside of this deployment pipeline – in the next post we’ll configure TeamCity to deploy a package to Test environment which was deployed and tested on Dev environment.